Wow, Little Rock was amazing. Not only did we experience a record breaking earthquake, we experienced a marvelous glass show. 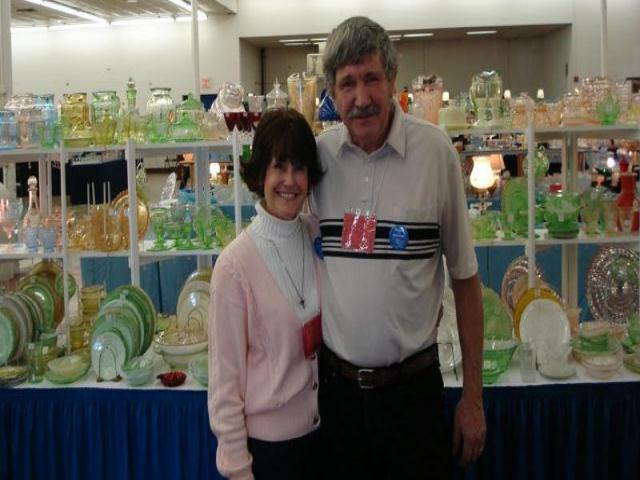 This was the Arkansas Glasshoppers Depression Glass Show’s 25th Anniversary Weekend – and man we had fun! I would like to give a special shout out to the show for providing us Depression Glass dealers delicious food during set up, thank you, it was much appreciated. While I was wheeling and dealing, I realized how much glass shows are a wonderful way to connect with great people and view glass that you have only seen in books. Rare patterns and beautiful pieces grace the tables of the most experienced and well versed Depression Glass dealers in the country. Depression Glass dealers are a great resource for explaining the difference between reproduction glass verses original glass as well as a repaired glass verses perfect glass. Glass shows are super fabulous, to both knowledgeable glass enthusiasts and those just starting their collections. Glen and I hope to see you soon at a glass show. We would love to meet and talk with you about your collections. We may even have a hard to find piece that fits right into your home. Check out our show schedule here. So much can be learned just by visiting a booth and taking a look around……experiencing the scenery.